Hot Dogs & Guns: Blaming America's Decline on the Wrong People! 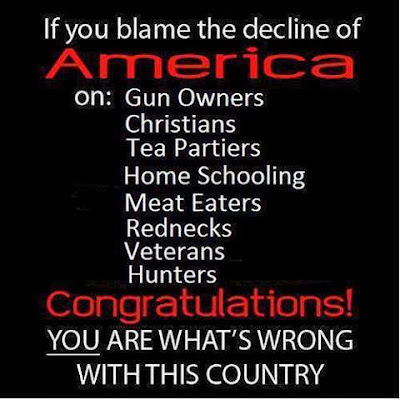 Blaming America's Decline on the Wrong People! If you blame the decline of America on: Gun Owners, Christians, Tea Partiers, Home Schooling, Meat Eaters, Rednecks, Veterans and Hunters. Congratulations! YOU are what's wrong with this country.